The Gulf of Maine Association (GOMA), a United States 501(c) 3 nonprofit organization, manages day-to-day contractual and fiscal operations in support of Council initiatives. GOMA supports the Council programs and projects by raising funds, approving budgets and overseeing compliance with all grants and contributions. For more information on funders for specific Council initiatives, please see funder credits on individual program pages. In addition, GOMA provides fiscal agent services to organizations that have a similar mission to that of the Council. Currently they provide this service to the Northeast Regional Ocean Council and the Regional Association for research on the Gulf of Maine. 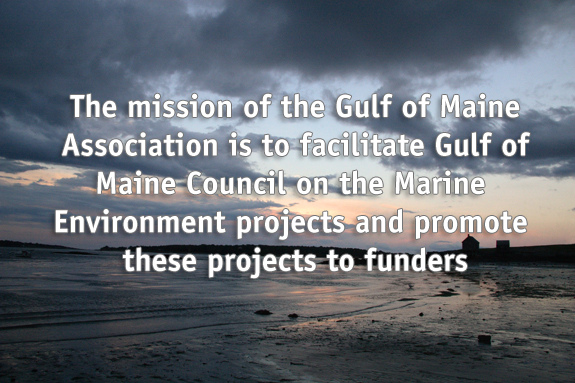 The Gulf of Maine Council on the Marine Environment set up two Associations to provide contractual and fiscal management in support of the Council’s activities. The Gulf of Maine Association, a United States 501(c) 3 nonprofit organization, has Board of Director membership that includes representatives from both Canada and the United States. The Association of Canadian Delegates to the Gulf of Maine Council on the Marine Environment (Canadian Association), a Canadian charitable organization, has Canadian Board of Director membership. The Canadian Association processes contracts from Canadian funding sources and transfers funds to be managed by the Gulf of Maine Association. Both Associations comply with their own bylaws and nonprofit/charitable organization guidelines in their respective countries. For more information on the Canadian Association please use the link below.